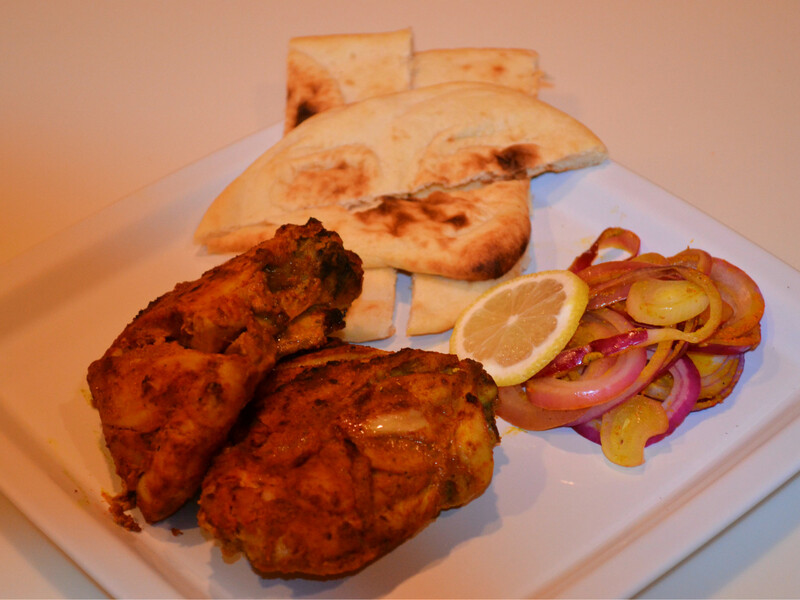 Tandoori Chicken is a popular Indian dish, originating from the northern parts of India. Even though India is a large country with vastly different cuisines, the dish Tandoori chicken is the closest contender to be called the national dish of India. It consists of roasted chicken prepared with yoghurt and spices and served as an appetizer before the meal. Traditionally it is made in a clay oven (or so called “tandoor”) at high temperature; hence its name Tandoori chicken. This recipe is adapted to the modern day conventional oven but still retains its authentic taste. Note the additional time for marinating the chicken; 4 hours. Grind together coriander powder, cumin powder, garam masala powder, ginger-garlic paste, black pepper, salt, dry fenugreek leaves and red chili powder to a fine paste. Put the paste aside. Remove skin from the chicken. Make deep cuts on both sides of the chicken. Mix together red chili powder, turmeric powder, and lemon juice. Apply this mixture to chicken pieces rubbing it into the deep cuts of the chicken. Cover the chicken and put aside to marinade for 15 minutes. Mix the Tandoori paste with yoghurt into a smooth sauce. Pour the mixture onto the chicken covering each piece on both sides, allowing mixture to get into the deep cuts of the chicken. Mix together apple cider vinegar and oil and sprinkle onto the chicken pieces. Cover and refrigerate for 4 hours. Pre-heat oven to 225°C (437°F). Remove the chicken pieces from refrigerator and lay them on an aluminum tray/foil. Put them uncovered on the middle rack of the oven for 25 minutes. After 25 minutes in the oven, put them in a broiler and broil each side for 3 minutes. Garnish this tandoori chicken with thinly sliced raw onion and lemon or lime, cut into wedges, and serve with Naan bread. Nirupama Rajadhyaksha was born in India, but currently lives in the USA. She loves and cherishes the authentic culinary taste of her home country in her cooking. Besides doing the dual role of a working professional and homemaker, Nirupama is also a proponent of the science of Ayurveda and loves to use its basis for making fresh, “taste good to the soul” cooking. Soon, you will be able to see more Indian recipes on Nirupama’s forthcoming blog.